View our fine selection of eternity rings made from 14 karat yellow and white gold. Hand-matched diamonds with maximum brilliance set in 18K gold to make the perfect eternity ring. Desirable collection of platinum eternity rings to celebrate your occasion. Fine selection of eternity rings made from 18K two-tone and tri-color gold. 14K White Gold Wedding Band. 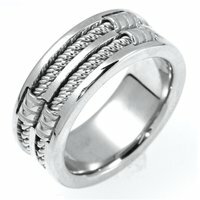 WeddingBands.com gold wedding bands are the pinnacle of precious metal wedding rings. Whether you want 14 karat or 18 karat our rings are manufactured to the highest standards in the world. We back each with a lifetime warranty against manufacturing defects and stand behind a 30-day money back guarantee. The sophistication and style of a gold wedding band will outlast all trends and fads. One of the oldest precious metals to be fashioned into a wedding ring is gold. We continue the art of manufacturing gold wedding rings. The purity of gold is expressed in karats (kt), on a scale of 24, or in fineness, on a scale of 1,000. Pure gold is 24 karat, or 1,000 fine. 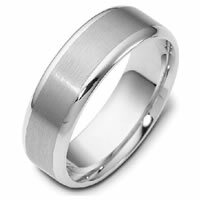 18K gold wedding band has 75% gold mixed with 25% alloys; it should be stamped as 18K or 750 to show the percentage of the purity. A 14-karat gold wedding band will be stamped 14K, 14kt or 585 to show the purity of the gold in that wedding band. 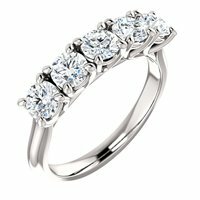 All gold wedding Bands manufactured by Wedding Bands are solid 14K or solid 18K gold. 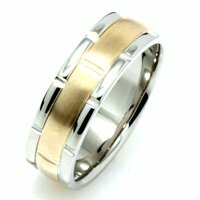 We do not manufacture gold plated wedding bands.